Finally! I started this post on April 30th and is part of the reason for my lack of updates. It felt like such a daunting task but I've finally conquered it. Sorry for the length, I just wanted to be done and not keep dragging it out forever and ever. So read on, if you're willing to finish this journey with me! The first 24 hours of Linus' life is a complete blur, so I'm not going to attempt to record it chronologically. 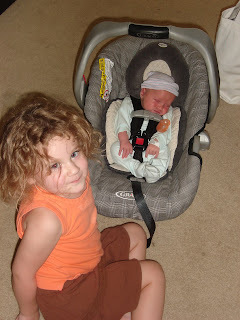 Emotionally, I was a wreck and vowed to Duncan I would never have another baby. I started pumping in the middle of the night. Duncan brought down the milk to store in the NICU fridge for when Linus was ready to eat and to check in on him. One time, Duncan was gone for a really long time and I started to get worried. My nurse helped me to call down to find out what was going on. Apparently,when Duncan arrived, Linus was awake, so Duncan decided to spend some time with him. He felt bad that I was worrying, but I assured him that it was ok. I felt so horrible that Linus was all alone and was happy that one of us could be with him, even if only for a short while. The next day, Thursday, was Amelie's pre-school orientation. I insisted that Duncan take her (and not my parents with whom she and Violet were staying). I felt like our timid one needed one of us to be there for something that was such a big deal. My mom brought Amelie to the hospital and she and Duncan went to the orientation while my mom stayed with me. One thing I did with my mom while Duncan was gone, was to visit Linus. This was the lone picture taken of him on Thursday, August 30th and my mom took it. To visit Linus was such an ordeal that day. I was still hooked up to an IV and had to bring everything with me, wherever I went. I also still had my catheter in the early part of the day. That was pleasant to carry around with me. I was hardly able to walk and therefore had to ride down in a wheelchair. It seemed to take forever to get down there. When I first saw him, I was reduced to tears. Every exhale was still audible. My mom, who is always armed with her video camera, has the only video of him grunting. At the time I was totally annoyed with her for taking a video, but I'm now thankful that we have that. On Thursday, they still weren't too keen on anyone holding him, but they let me hold him for a few minutes, which was all I could physically handle anyway. He, too, was hooked up to a gazillion different things, which made it quite an ordeal to transfer him from his bed to my arms and back again. I remember my mom asking his nurse if Linus was her only patient. She said that he wasn't and that that was a good thing. In other words, it's a good thing to be stable enough to share a nurse with other patients. 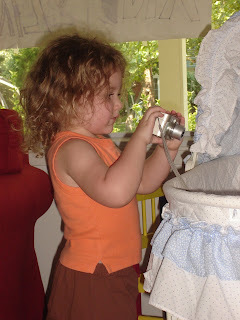 While I wanted my baby to have one-on-one care, I understood what she was saying and I agreed. I'm not sure how many times I visited Linus that day...three maybe. It was physically and emotionally exhausting. I wanted to be with him non-stop but I couldn't physically handle it. I was in so much pain. I felt so guilty when I left him. I remember trying to remember what he looked like, but not being able to do so. I didn't have a solidified mental image of my baby and that killed me. Physically, I was in a lot of pain. Incision/surgery pain, yes. But the worst of it was gas pain. If you've ever had abdominal surgery, you may have experienced it. The pains were up to my neck. Another aspect of my physical condition was my extremely elevated heart rate. It seemed to get faster as the day wore on and my nurses were freaking out. My doc, who is apparently very laid back and isn't quick to order tests, heard about the pain I was having and my elevated pulse and ordered a CT scan. I guess what I was experiencing were symptoms of a pulmonary embolism, also known as a blood clot in my lung. Since I had been in bed for so long before Linus was born, I was at risk for a blood clot, even though I wore my S.C.D.s pretty faithfully. (And no, the doctor didn't order the T.E.D.s until after surgery. All of my ante-partum nurses were incredulous about this. Like I was hiding them under my pillow or something.) I had to have some blood tests before the CT Scan (more sticks!) and then my nurse found out I HAD TO have an 18-gage IV in for the procedure. There were no exceptions. The 20 from the night before Linus was born was the only one I had in at that point, since the 18 the anesthesiologist had put in just before surgery had failed in the recovery room. Duncan, who has always encouraged me to stand up for myself, even if it makes waves (which I hate to do) was so proud of me for pushing that day. "You push but when they push back, you need to give up. They know what they're talking about." The nurse reiterated that this particular doctor doesn't order such tests lightly, and must be really worried. So we went forward with it. This fabulous nurse (Kristen?) went down to Labor and Delivery and found the Primo Nurse for hard sticks. (Did I mention how hard she worked for me that day, even though she was the charge nurse, as well?) The Primo Nurse came in and I explained that I DID NOT want her to talk about my veins and how bad they were. I had heard countless nurses talk through the process of trying to start my IVs, how bad my veins were, where they thought a good vein was, etc. and I was SICK OF IT! I can't remember WHAT we talked about, but it had nothing to do with IVs or veins and she got it started in one try. No wonder she was on the cover of the AAMC magazine a few months later. I'm glad to say that the CT scan came back negative for a PE. At that point, I was able to relax and continue to work on recovering (ie. passing gas, which did start to happen). We had some visitors that night, which made for an enjoyable time. The next day, Friday, August 31st was MUCH better. I became IV free, my pulse went down, I saw and held my baby more, and enjoyed more visitors. Linus was improving, still grunting and still having assistance of air being forced into him, but the percentage of oxygen was able to be decreased. Saturday, September 1st was even better. 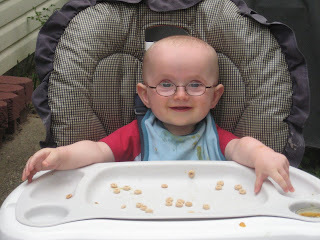 I'm not sure when Linus became a "normal baby," but it was somewhere between Saturday and Sunday. He started tube feedings on Saturday and responded well. I nursed him for the first time on Sunday afternoon, right before I went home. After 27 days in the hospital, I got to go home. 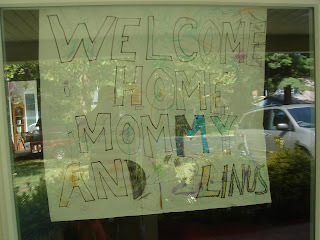 Here's the sign the girls made for me. 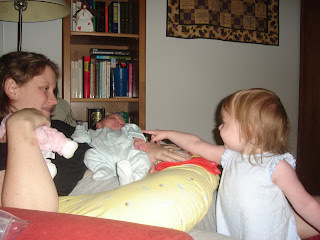 I didn't have my baby with me, which I hated, but I had two little girls that were very happy to have me back. I remember Amelie asking me over and over again if I was actually staying. She couldn't seem to believe that I was there for good. Duncan and his dad (who had come into town on Saturday to help with this transition) had the house in as good condition as could be expected after such a month. Even the bassinetes were set up. I didn't like that they were empty, but the Lord showed me in that time, that he was being very merciful to me. He gave me three days at home with just my girls...to read, to play, to cuddle, to laugh. He also let me have the peace of mind of leaving a perfectly healthy little boy in the NICU, who was just there to finish out his antibiotics. In His mercy, I was able to transition back into my role at home, without Linus. He was gently added into the mix three days after my return to home. This was perfectly orchestrated by my heavenly father, I have no doubt. There's more I could go into. Like about how the toilet backed up on Monday, as I was showering in preparation to visit Linus and on Wednesday, while we were getting ready to pick up Linus to bring him home. (It also backed up three days later, and got slow again in November...resulting in the expensive yard dig and pipe replacing.) How his "coming home" outfit, that Amelie and my mom picked out for Linus, was in the washer during the back up, so I couldn't bring it with me. How Amelie's first day of school was also the day I had to get my staples removed, so we barely made it back to pick her up in time. How I experienced extreme nerve pain in my back and head, from the the numerous spinal attempts. But I'll choose to go into detail about Linus' sweet homecoming. When we arrived, Roto Rooter had fixed our plumbing (for a few days at least) and Violet was napping. Amelie got to have Linus all to herself for a few minutes. 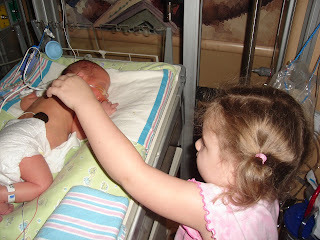 And then, I got to experience Violet seeing her little brother for the first time. At just 19 months, she wasn't allowed in the NICU and we weren't sure what exactly she understood about the situation. She woke up from her nap and came out to the living room to find me holding Linus. She acted as if it was Christmas morning, she was so excited. It brought me to tears. Here are the pictures of that moment...so precious to me. This may be my longest post ever, but please bear with me for just a bit more. It was hard. August of 2007 will certainly be hard to forget. It was life-changing for me in so many ways. It's one of those "before my hospital stay/after my hospital stay" kind of experiences. Life will never be the same for me, after that experience. Ultimately, I'm thankful for it. It may sound trite, but it was all worth it. I have a new perspective on so many aspects of life and can see the Lord's hand throughout the experience. It reminds me of the memory verse from my first summer at Pine Springs. "Be careful that you do not forget the Lord your God. He led you through the vast and dreadful desert, that thirsty and waterless land, with its venomous snakes and scorpions. He brought you water out of hard rock. He gave you manna to eat in the desert, something your fathers had never known, to humble and to test you so that in the end it might go well with you. You may say to yourself, "My power and the strength of my hands have produced this wealth for me." But remember the LORD your God, for it is he who gives you the ability to produce wealth, and so confirms his covenant, which he swore to your forefathers, as it is today." I have vowed to not forget this experience. To appreciate my children, my home, my husband, my extended family, my church family, my friends. To remember how it felt to feel so helpless. So isolated. So far from all of those I love. I've vowed to remember the Lord who brought me through this ordeal. Who ordained each and every detail, for my good and the good of those that walked thorough it with me. I've vowed to live differently, because of this experience. Am I always successful to keep these vows? But I am successful at remembering. At looking back on the "monument" of August 2007. When the Lord molded me and chiseled away at me, in an effort to make me more in His image. And when he gave me my dear, sweet Linus. Linus Victory at (two days shy of) 9 months old. Thanks for sticking this out. And now, I should be able to post normally again. Sigh....oh Nancy, thank you for sharing your heart through these posts. I am a bundle of emotions right now, but God is SO good, and His timing is always perfect. Your Linus is just precious, and you will appreciate him even more after the trials of him coming into this world. Loved the verses you chose too. Wow. What a story. I can't even imagine a 4-week stay in the hospital with little ones at home. 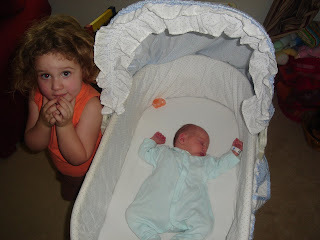 Romilly was in with RSV for 6 days, and that was rough enough! Praise the Lord for getting you through it and for giving you such a good perspective on it! Did you ever tell us what he weighed? Thanks! I have long wondered what the rest of the story was-- you hinted it at after Linus was born. 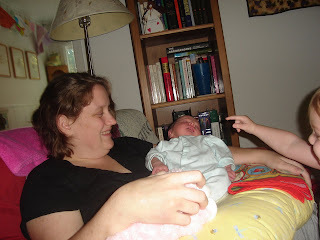 I can relate to a lot of your experiences-- the painful gas (the only thing that helped me was the pain meds and a heating pad on my shoulders) after a c-section, crying every time they come near me for an IV... i finally had the anasthesia guys (sp) do it because of veins rolling, lots of valves, etc. Get it on the first try and don't tell me what you're doing-- otherwise I am a basket case. I make them cover up the needles with washcloths and tape; i HATE seeing that thing protruding out of my skin (or staples, stitches, etc for that matter). 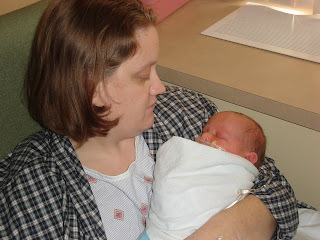 Paul was in NICU for only three days; we were agressive to get him out or it would've been five. his delivery was so rough we thought he was having seizures; it was just a bad headache for him and nothing scary. 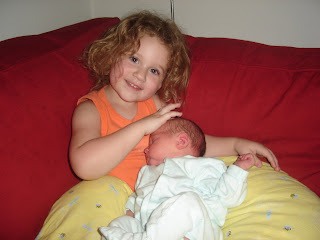 Wow... your hair was so much shorter back then -- and Amelie looks so much younger in the pictures. Time flies. Thanks for sharing this story. So sweet. 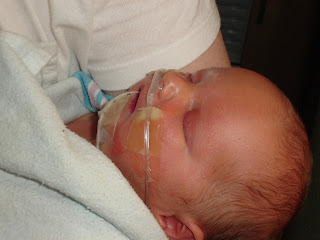 nanc, i just re-read all 4 parts of his birth story and have been brought to tears several times. thank you for the lesson (and reminder!) that God is the one who brings us through these things, that even the difficult experiences serve a purpose in his perfect, heavenly vision for us. I can't even believe how crazy and complicated and trialsome that experience was for you! WOW! WOW!!! I just keep thinking about it and how amazing it is that when I ran into you a few months later, I didn't know any of this - you certainly wore your trials well! What I'm trying to say is - you have a wonderful attitude about the whole thing and we praise God with you for your sweet little Linus -- who you have rightly said - was worth all of it!